Mark McMahon and Will Rooney team up to discuss Pompey’s top-of-the-table clash with Peterborough. The two unbeaten teams go head-to-head at London Road tomorrow, with the Blues keen to return to the summit of the League One table. 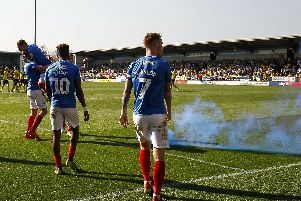 The duo discuss the Blues’ chances of maintaining their impressive start to the season and leapfrogging their hosts in the standings, a potent Peterborough strike force, the return of Ronan Curtis to the Pompey first team, Christian Burgess and possible changes to the side that drew 1-1 with Shrewsbury last weekend.